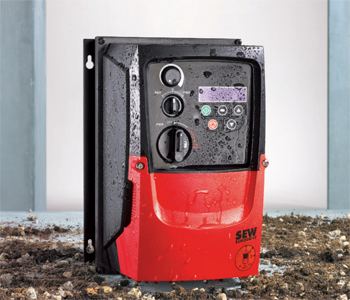 The new SEW-EURODRIVE MOVITRAC® LTE B frequency inverters provide the best conditions for simple applications. Designed and developed for speed control in asynchronous motors, it is particularly economical when used in conveyor applications, e.g. for small, modular conveyor lines, fans and pumps. The SEW-EURODRIVE MOVITRAC® LTE B is available in three sizes for power ranges from 0.37 to 7.5 kW and supply voltages of 115 V, 230 V and 400 V.
In addition to the standard version in degree of protection IP20 for installation in the control cabinet, there is also a version in degree of protection IP55 / NEMA 12 and IP66 / NEMA4X, to be used under specific environmental conditions. In this way, these frequency inverters can do their job reliably and flexibly even when exposed to dust or water.